For an event that usually takes place in a field, the average festival is far from a green affair. Emissions from travel to and from the sites, the mounds of litter and those diesel-guzzling on-site generators mean that, while a lot of major festivals promote a green ethos in principle, their actual carbon footprints tell a different story. Oxford university researchers have analysed the environmental impact of 500 UK festivals and found that, combined, they emit around 84,000 tonnes of CO2 a year. Research from campaign group A Greener Festival shows that the green issue is a high priority for some music fans, with 48% of respondents saying they would pay more for greener events and 36% stating that green issues were an important factor when buying a ticket. So what are festivals doing to respond to this demand? The experts are in unanimous agreement when assessing which part of a festival has the biggest impact on the environment: transport. According to Julie's Bicycle, an organisation set up to help the music industry reduce its carbon footprint, moving people to and from festivals contributes 68% of the festival sector's total emissions – around 45,000 tonnes. In response to this, lift-sharing initiatives such as the Glastonbury Car Share Scheme have been set up across most of the major festivals. Latitude places a strong emphasis on sustainable travel by offering people who lift-share the chance to win a VIP upgrade. However, it is clear that festivals still need to do more to make public transport to the sites widely available, and to encourage people to use it. A major headache for the big festivals is the question of how to deal with the major side-effect of having a party with a 100,000-strong guest list – namely, the heaps of litter. Most provide recycling facilities on-site that make it easy for people to separate their rubbish. 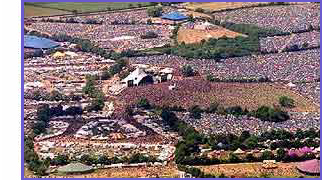 Interestingly, Festival Republic – responsible for promoting Glastonbury, Reading and Latitude – tailors its wast-management schemes to different audiences, so that younger crowds like those seen at Reading and Leeds are offered incentives to dispose of rubbish properly in the form of beer and money. Forty nine per cent of the rubbish at Glastonbury was recycled last year through the use of clearly labelled recycling facilities. Even so, an army of litter pickers is deployed every year for a week following the festival to clean up after messy guests, proving that there is still much to be done. A growing trend among some festivals is clean energy generation. The Croissant Neuf Summer Party in Wales runs entirely on power from renewable sources, but larger festivals will struggle to generate enough electricity to power themselves in this way. One thing is for sure: there is a world of difference between possessing good green intentions and having the resources and organisation to put them into practice – especially for the larger gatherings. Ben Challis, from A Greener Festival, says: "We have noticed that the smaller festivals are better for dealing with environmental concerns but the big festivals do have a lot to consider. A proposal to put recycling bins everywhere could clash with health and safety or crowd regulations, for example." In 2009, Bestival and the Isle of Wight were the only big UK festivals to receive an "outstanding" award from A Greener Festival for their commitments to reducing their impact on the environment. Let's hope that more of the big festivals can clean up their acts this year. This page was generated in 0.3086 seconds.